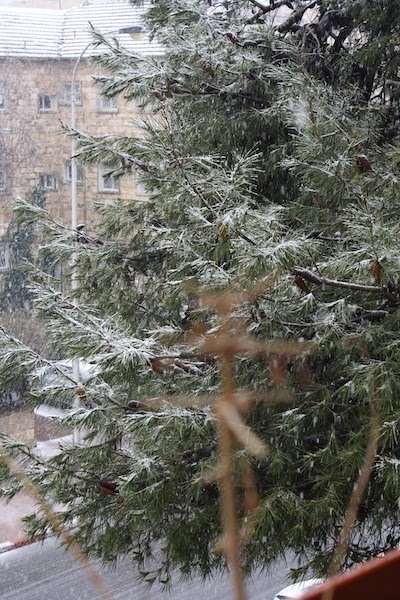 Though this is not - by far - my first snowfall, it is certainly the first one for which I was cognizant. And as you can see from the photos, I was quite surprised by this powdery, cold substance that was falling from the sky, furiously at times. 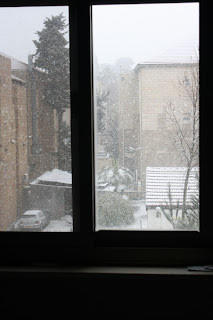 But more than a year before this rare snow "storm" in Jerusalem (zero accumulation, mind you), I lived through the real Snow-pocalypse in New York City - the blizzardS of 2010 and 2011. I was only a few months old so my memory of that is as hazy as the fog is over Jerusalem today. However, my parents have not stopped talking about the various ways in which it ruined our vacation in New York at the time. I never saw this in Jerusalem before! Full disclosure: It was a lot of bark with little bite. Nothing stuck. Poor snow was vanquished as it hit the ground. In just two days of March, the weather has proven to be even worse than all of rainy, windy February. How is this even possible? 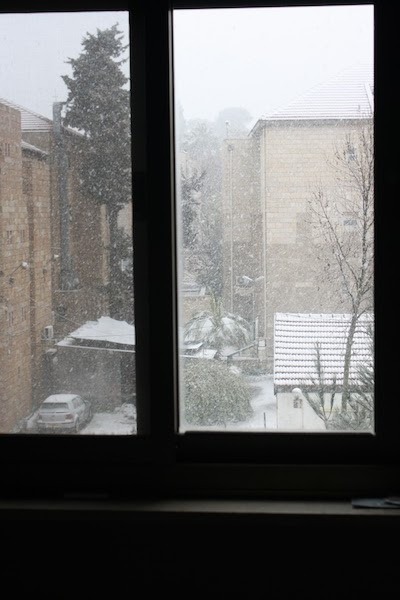 Today's challenge, thanks to said weather, was a bit different from when we were in New York: How to keep warm at home with no central heating as Jerusalem temperatures plummeted to 30s (Fahrenheit) outside and 50s in the apartment! My parents concocted all sorts of ways to stay warm including saving up laundry for today so they could use the dryer and channel the damp steam into the house; baking fattening foods thereby keeping the oven on; and pulling all the space heaters out of storage and running up the electric bill. They also futilely cordoned off yours truly in the carpeted area so that I would stay warmer by not crawling on tile. That didn't last long as I found ways around the barricade into glorious freedom. Finally, the barricade was disassembled and the farce ended as I resumed my rule in the apartment, conquering room by room. But we were all homebound for a predicted 48 hours since the interminable downpours, crazy winds, sprinkles of hail and yes, the snow, kept us seeking refuge in the semi-warmer apartment where at least we weren't getting wet. Yet. 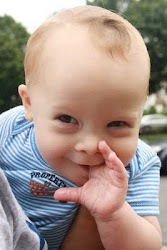 I did use the time in lockdown wisely to get to know my baby brother Lucas a little better. Getting to know Lucas. 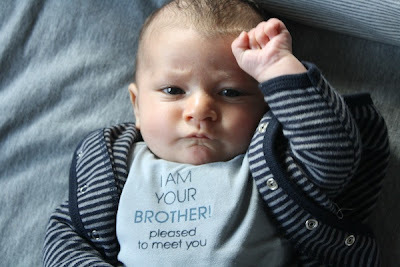 I am also pleased to meet you! Here is a video of us getting to know each other and officially meeting at last, since I shake his hands (about 2 minutes into the video), which makes it official. As you can see in the video, we are communicating in baby code - and my parents don't understand a word of what we are saying! 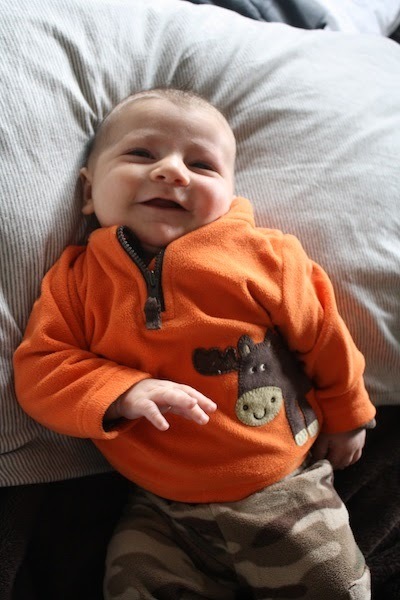 I do find these sessions rather frustrating though as my parents hold me back from fully expressing myself with my baby brother. I wonder why. oh my gd this video is too cute!! !